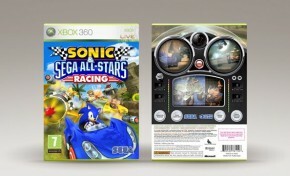 Very late last night, we reported–and, unlike many other sites, labeled as rumor–the surface of some concept art for Sonic & Sega All-Stars Racing. It was from Sega Europe designer Chris Lewis, and on his portfolio website he posted some preliminary box art for the game–which included a back cover containing Banjo and Kazooie, of Rare fame. That set off a flurry of Internet activity and as yet unfounded reports alleging a confirmation that the duo will make an appearance in ASR, and furthering other reports that console-specific characters will set foot in the game. It also set off an alleged confirmation of DLC, even in the face of a pretty consistent message that the idea is only being considered. The fact that Lewis has cut off public access to his portfolio–where the image you see above was found–only helped fuel the fire. Today, TSSZ News went right to the source at Sumo Digital, and you may want to reconsider everything you’ve read–because the hope of Banjo-Kazooie and any derivative hopes may have been quashed. “Banjo in a SEGA character racing game? Really?” quipped Steve Lycett upon request for comment, adding that the company has not seen any box art. It is a fair point, and it is the main reason some in the community haven’t put all their chips in the above imagery. But juxtaposed to the implicit denial is the relative inconsistency and sometimes deliberate confusion tactics on new ASR details until the time is right, with only an expected 3-4 months before launch. The lack of knowledge helps to fuel anxious community bubbles, with the tiniest of details–true or false–serving as a sharp pin. That scenario has appeared to again transpire in the past 24 hours. So, while we will follow-up on anything related to this, and the DLC murmurs remain just that, gamers may now want to file the Banjo-Kazooie rumors as improbable at best. That appears to be the official word, straight from Sumo Digital.